Ever since he was little, Takashi Natsume has been able to see what others could not, namely monstrous spirits known as Yokai. Natsume's late grandmother, Reiko, would challenge Yokai to contests and the ones that lost had to sign a contract with her, binding their names to her "Yujin-cho." Ever since Natsume has inherited the book, together with Nyanko Sensei, his self-proclaimed bodyguard, he spends his days trying to return the names within the book to their owners. 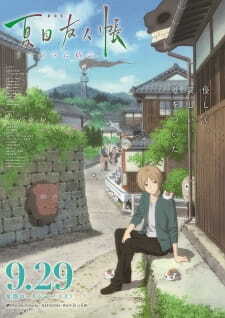 Natsume has been busy, navigating between humans and Yokai when he coincidentally reunites with an old classmate, Yuki. It brings back painful memories of a certain Yokai. Meanwhile, Natsume also became acquainted with Yorie Tsumura, a woman in the memories of a Yokai whose name he had returned. Yorie knew much about Reiko, but now lived a peaceful life with her only son, Mukuo. Being with this family was comforting for Natsume, but apparently a mysterious Yokai has been lurking in their town. On the way back from investigating, a "Yokai seed" that had latched itself to Nyanko Sensei drops into the Fujiwaras' garden and grows overnight into a fruit tree. When Nyanko Sensei eats a fruit that is somehow shaped like himself, he suddenly splits into three!